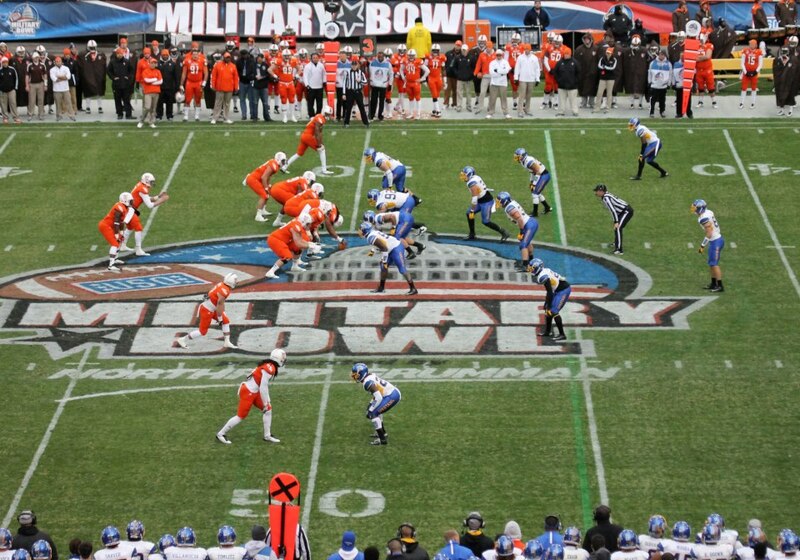 Last year, San Jose State beat Bowling Green 29-20 in an exciting Military Bowl. This year’s rendition features Marhsall playing Maryland in their first ever match-up. Dec. 27, 2:30 p.m. ET (ESPN). Line: Marshall by -2.5; O/U 62. Series Record: 0-0, first meeting. The Maryland Terrapins (7-5, 3-5 ACC) started the season strong with a four game winning streak that was snapped by a dominating Florida State squad in early October. Maryland then suffered a mid-season collapse dropping four of five games but closed out the season with two big wins against Virginia Tech and N.C. State going 7-5 earning an invitation to the Military Bowl. Doc Holiday’s Thundering Herd (9-4, 7-1 C-USA) had a less turbulent ride to the post-season going 9-4 winning five of its last six games to earn a date with Maryland. Marshall is the Conference USA East Division champs that ultimately lost to Rice 41-24 in the conference’s championship game. Though Maryland is outscoring teams 27-25 this season, the Terrapins will have to rely heavily on its defense to win this game. All-ACC honorable mention DE Marcus Whitfield will have to be explosive off the edge and disrupt Marshall’s QB Rakeem Cato and his high-octane offense that is very balanced and fast paced that averages 80.2 plays per game. Maryland ranks 36th nationally in total defense allowing 367.7 yards per game yielding 215.8 passing yards and 151.9 rushing yards per game. These numbers are a bit deceiving as the 63-0 lopsided loss to Florida State skews the numbers. In that game alone, Maryland’s defense surrendered 614 total yard (431 passing, 183 rushing). Though two of Maryland’s top three receivers are out for the season (Stephon Diggs and Deon Long who were both lost October 19th at Wake Forest), the Terrapins, who are led by the injury prone but dynamic QB C.J. Brown, managed to complete over 58% of his passes airing it out for 2,045 yards with 11 TDs. Brown also ran for 538 yards and 12 TDs. Head Coach Randy Edsall finds ways to generate offense despite fielding a team decimated by injuries at key positions. The Herd is bringing to Annapolis an explosive offense that averages 43 points per game, 211.2 yards on the ground and 291.2 yards in the air. The Herd, who is outscoring teams 43-23, is led by the elusive and accurate Conference USA offense player of the year QB Rakeem Cato who has scampered for 276 yards and six touchdowns and completed over 59% of his passes throwing for 3,579 passing yards with 36 TDs. Behind Cato is a trio of stellar running backs, Essray Taliaferro (1,059 yards for 9 TDs), Steward Butler (762 yards for 8 TDs), and Kevin Grooms (503 yards for 6 TDs). Rakeem Cato will also have a strong hands team at his disposable to include wide receivers Tommy Shuler (1,097 yards for 9 TDs), Gator Hoskins (717 yards for 13 TDs), Devon Smith (599 yards for 4 TDs), and Craig Wilkins (373 yards for 2 TDs). Marshall’s Achilles heal, if they have one, is a defense that yields 366.8 yards per game, including 208.9 in the air and 157.9 on the ground. Prediction: Maryland will keep it close, but in the fourth quarter, QB Cato and the Herd’s speedy offense will outscore the Terrapins and take home the win.